A real custom service: together with its customers, KSB develops tailored framework agreements ranging from single maintenance modules to a Total Pump Care package. A KSB framework agreement offers individual solutions This comprehensive service concept from KSB offers customers the chance to put together a service and spare parts package tailored to their specific requirements. Spare parts stocks, for example, can be structured far more efficiently thanks to our inventory management under a KSB service contract, significantly reducing costs. To simplify the development process for a framework agreement, KSB developed TPM, which stands for Total Pump Management. This is a modular service concept for pumps, valves, motors and other rotating equipment. To create their KSB service contract customers can choose from and combine all modules found under the three features Services, Reliability and Conditions. 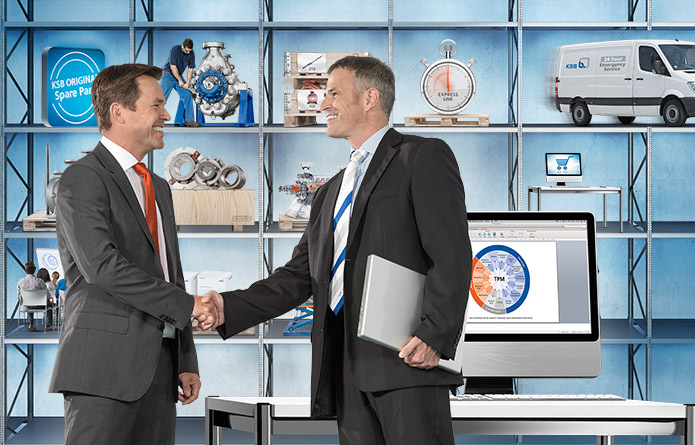 On this basis, our experts develop the KSB service contracts in cooperation with the customer – from single maintenance modules to a Total Pump Care Package. This offers maximum planning reliability and optimum availability of the pump system. Maintenance and life cycle costs are thus significantly reduced. Always striving to find the best solution for your system: KSB’s service specialists advise you individually and will provide long-term support. The KSB TrainingCenter offers tailored seminars and training.